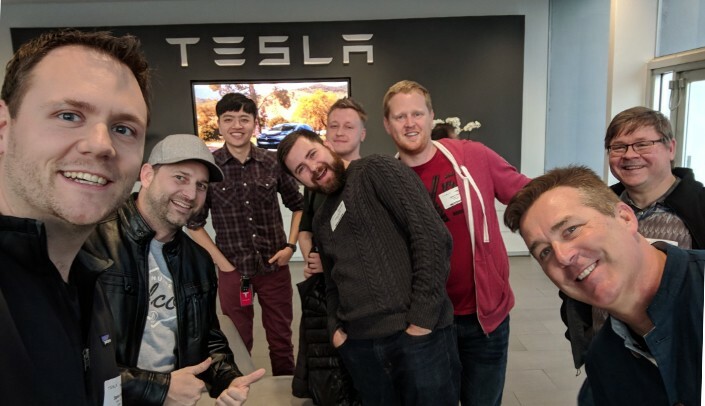 At Tesla, I came up with an idea to hold monthly Web Development meetups where employees could learn from each other and the external community. 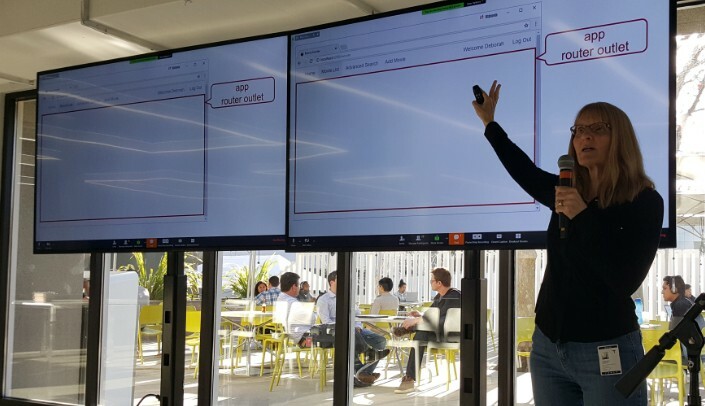 We wanted to create better cross-team collaboration, identify sharing opportunities, and identify and leverage best practices. I want to share my story with the hope of inspiring more communication within and across other companies. The idea came to me after noticing a lack of events and forums where co-workers could talk about front-end development. These meetups were immensely valuable for me and for many of the members of our team. Our original idea was to start a meetup and run it monthly for six months as a trial. To kick things off I found a trusted partner to help out with recording audio, video, taking pictures and to setup and breakdown the event. We booked a conference/training room for a six month period we had committed to with a goal to bring developers in our company closer together and to help build new relationships. We created signage and directions for stairwells and elevators, because not everyone may have been to the room before. We chose to have two speakers each night. One was a guest from the community, the other was a developer from one of our teams. We had food and drinks which always creates a welcoming atmosphere and surely was a big draw and helped to kick-start our first meetup. Overall, I consider our meetup a success. 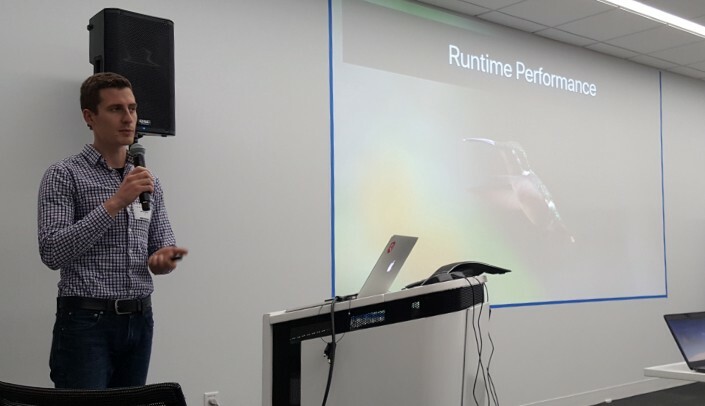 After the success of our first meetup, we followed our plan to run many more follow-up events. We learned a lot in running this meetup, so here are some of my top recommendations for others considering starting a meetup. Send out a reminder the week before and the day of the event. Make sure to highlight why a talk would be interesting or relevant to your team. Most companies have space to hold meetups like meeting rooms, training rooms, or a cafe. Holding the meeting at your company will significantly reduce many of the costs normally associated with holding a public meetup. Keep the cadence of the event consistent. If you are not consistent, you will make it harder for people to attend. Meeting at the same time and place every month makes it easier for people to attend. If things have to change, provide plenty of notice when this info changes. Try to think about avoiding periods where teams are releasing software, the end of the week, and the beginning and end of the month, as people are less likely to attend then. You should also factor in company holidays. 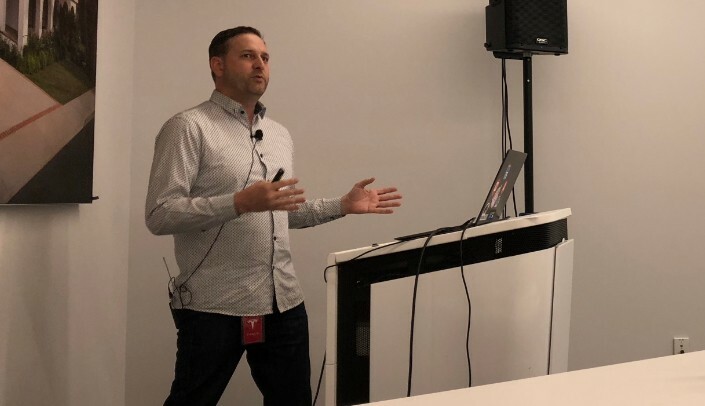 The greatest benefit was the ability of our front-end developers to engage with our guests and each other about topics that they might not have been able to find help with on their team or in their department. Most attendees walked away with a new network of individuals that they could reach out to for information, or to provide expertise in an area of technology that they were learning for the first time. Along with creating new relationships in the community, I also became aware of developers inside the company that I was meeting for the first time who worked on similar projects or technologies as me but I had just never had an opportunity to meet. Meeting these folks opened up new opportunities for me, like sitting on a weekly design board for a CSS framework we were building in-house. Think about what topics and technologies you could see yourself explaining or talking about, and be aware of what technologies your company is using on a wide scale as these are usually good places to start when deciding on a niche. It’s a good idea to conceptualize a common thread or theme in your meetup and then build the marketing of your meetup around that. For our meetup, we wanted to promote front-end technologies and software design in general. This was a bit too generic of an idea and we quickly pivoted to talks specifically around Angular, single page application development, and state management. Get out and attend other meetups before trying to start your own. This helps you understand the larger community and what may be missing or not being talked about. The information you gather from attending these meetups will help you build your micro version of the community. Be aware of what formats and talks work or don’t work at other meetups, always be learning (taking notes and pictures) from each experience at other meetups and use that information to help you figure out your own agenda. Within two months we already had well over 50 people coming to each event and those numbers got even better. 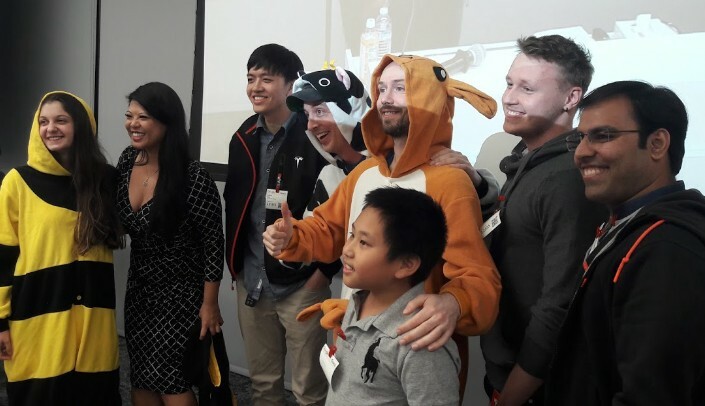 These were people who weren’t previously participating in a community at the company. I think that this large turnout really did help to get many individuals on our teams to understand and standardize concepts and patterns they were struggling with. You need to prepare from the beginning to be accommodating to all attendees. Of course have snacks and drinks available if possible, comfortable seating, high quality presentation equipment. Consider streaming the event internally to further your reach to individuals who cannot make it to the room or attend the event in person. Let attendees know that if they have suggestions, would like to contribute or want to speak at future meetups that you have a process for submitting talks. This will make them more willing to engage with the speakers and the host. Similar to the Angular Code of Conduct, having a code of conduct that speakers and guests adhere to is a great idea. Understanding how speakers and attendees should act and how to make others feel included is very important. Having a code of conduct and sharing it only takes a few minutes, but it may go along way in setting the tone for how others act and interact during a meetup and what is to be expected. Another an area we tried to help people feel welcome was by soliciting feedback and asking for ideas on future talks or if there was anything they would like to hear about that we could change about the meetup. The feedback you get will help to provide better content each month and broaden your context. When it came to booking speakers, I learned that if you want something, just ask for it. By not being afraid to ask and reaching out to individuals that are well known in the community, I was able to get solid speakers, which in return drove me to create better beginner level topics compliment the guests topics. I joined our guest speaker in presenting at some of the meetups, but I also opened this slot up to anyone who wanted to speak. The variation of difficulty levels in talks on the same night helped to make sure that everyone was getting something valuable out of each meeting. One the idea we had was to make our beginner level talks into somewhat of an open mic night, where developers who wanted to speak just needed to have a presentation ready to go. We did get several employees to do this on occasion. Running this meetup made me step outside of my comfort zone many times. Asking people I looked up to in the community to speak, committing to a difficult topic or code demo, hosting the meetups and introducing guests, working with the A/V department, interacting with guests and attendees and speaking in public. These are just a few of the things required of a host. By committing to these events and these duties I have definitely come out a more polished speaker, less terrified when talking to a group of people and more confident in my ability to talk about my craft. I put myself in situations where I had to make something happen each month and strive to do better each meetup. Most companies will probably be more than willing to chip in and help you succeed, my company was very supportive. After a successful six month run, I have a newfound respect for other meetups and the work it takes to organize and hold an event that contributes value to a group of engineers. I learned a lot from creating this meetup. I thank everyone involved from the speakers to the attendees. When each of us take the time out to attend or speak, I know that it’s valuable time given up and I appreciate everyone who gave up an hour or two to come and speak or listen to our speakers and I hope that they found tremendous value doing so.